Today's craft is super, duper easy and fun. We're going to make/embellish some hairpins. This is a great project to do with younger people as well because it's really easy. (While Rex won't be wearing one, he was really excited to help make them.) The reason for this project is that I've been wanting to wearing my hair (not my makeup) like these pictures I found on Pinterest. Then I saw these clips at Anthropologie and while I was tempted to get some, I figured making them would be inexpensive and easy. So I purchased some hairpins and clips at Hobby Lobby and I also stopped at an antique shop and picked up some vintage earrings. I invited my crafty friend over and we worked together. It's a good project to do with a friend, because there are two hairpins to make from each earring set - one for each person. After the supplies were assembled we broke out the secret weapon - Aleene's SUPER Gel Adhesive. I love this glue. It holds so well - even metal to metal. What I like about it the most is that it has a little brush in it just like nail polish. (Let's just say I've had some bad encounters with little tubes of super glue and there's still evidence on my kitchen table.) This stuff is way easier to use because of the brush. I used some wire cutters to snap off the back of the earrings. We brushed on some adhesive and added the earrings. You only have to hold the pin to the earring for a minute or two until it's really on there and dry. This clip was originally blank on top, but I happened to have little leaf beads that fit right in it, so I glued them on. Buttons also work well for this project. You just have to use ones that don't have a loop on the back. I had my assistant select some for me. I am excited to wear them now. The redish-brown one looked so cute in my friend's blonde hair. It's a great five minute project with fun results. These are SUPER cute. I love that they look vintage. Those are cute! I think I will make some this weekend with my daughters. They would love these! Esas trabas han quedado fantásticas. CUTE! and fun at the same time of making cuteness! Way cute! I keep meaning to make some of these--good to know what the best kind of glue to use is! You know, I don't think I can count how many bloggers that I've asked which kind of glue they use for stuff like this and none of them seem to be able to give me the time of day. THANK YOU for showing which glue you used! aggggg! love this...I have all the stuff I just needed the type of glue!!! 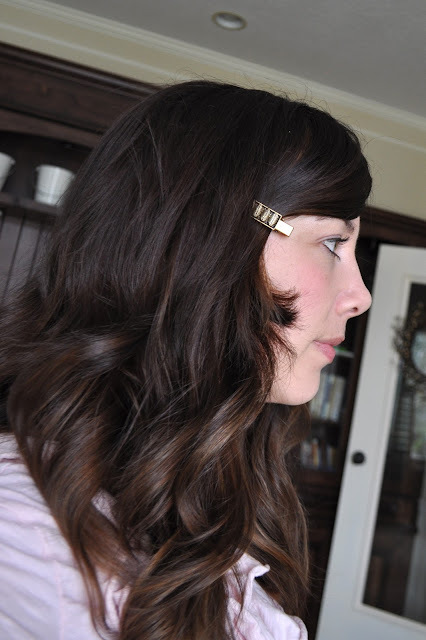 I love the vintage feel these have & they add a little POP to make an outfit complete!! Great idea! Thank you!! I definitely want to check out that glue. I've used so many different kinds and none of them seem to work. I've even used jewelry cement, and still things fall off. Thanks for the tip! These are so cute! 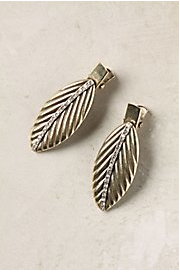 I love the white one and the one with the leaves on it! 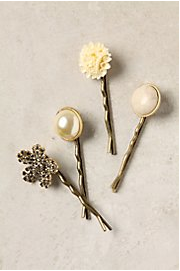 These are lovely and even though my daughter and I don't wear hairclips they would make great gifts. I have to say I am probably more excited to find out about another good glue though! Those are very cute! I will have to try it out! I love these. So easy and beats paying a fortune for something you can do yourself and do better! totally cute! omg...and i am really liking the pinterest hair too!! This is a great idea! 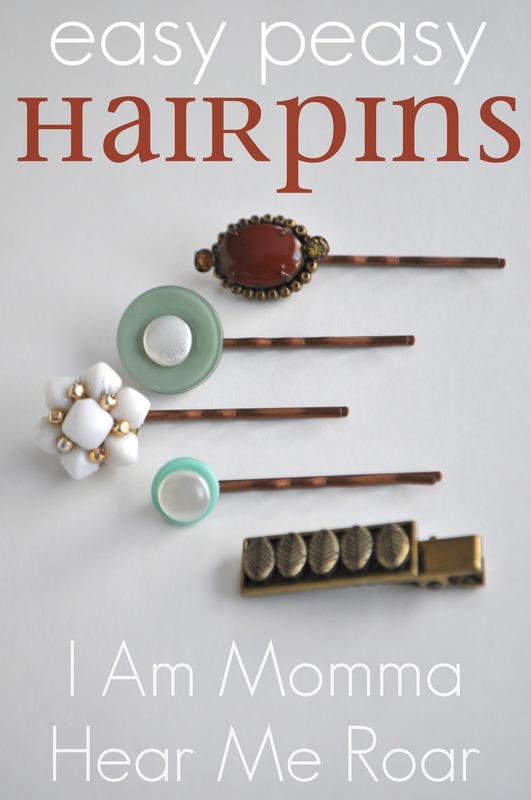 I have lots of old clip on earrings that were my grandmothers that would make lovely hairpins. I just watched your Martha video, and it was awesome. You did great. It looks like NYC was super fun. I love your goal for the year: giving. I read that as I sat overwhelmed by the incredible generosity of your parents in making, hanging, and perfecting my curtains, and painting my kitchen. You are invited over anytime to admire their handiwork! Generosity must run in the fam. Or you just are serious about your Christianity. Thank you. You inspire me! I picked up a big jar of earrings that were missing their matches from my local thrift store (totally cheap), and I think this would be a great use for these "pretties"! I saw these in the HJC blog and I LOVE them! I have LOTS of buttons I can use--now I just need to get the glue. In fact, I like the brush--it will make ALL kinds of crafts and repairs so much easier!